Disclaimer: This is a work of love and learning. Dedicated to Spike & Buffy lovers everywhere. There is something about Spuffy art that is very good for the soul…oh right….they’re meant to be! Please click the image for the full size version. Disclaimer: This is a work of love and learning. Dedicated to Spike lovers everywhere. 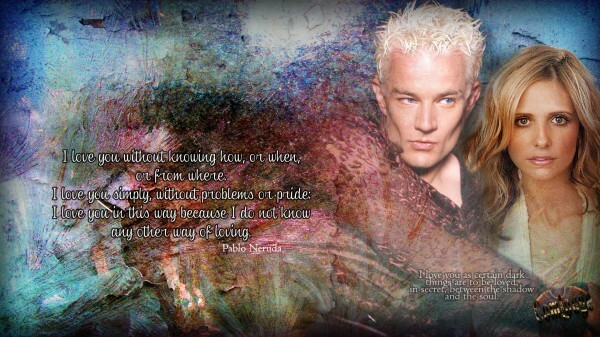 There is something about Spuffy art that is very good for the soul…oh right….it’s playing with Spike! Please click image for full size. A/N: As soon as I read the theme for this round I knew what I would do. I did however get All Saints Day and All Souls Day confused and had found this wonderful image through google to use because I thought I was doing All Souls Day – silly girl! I liked it too much not to use it, placing Buffy’s eyes bright and clear within it. If Joan of Arc is considered a saint I think Buffy the Vampire Slayer is most certainly a warrior saint and Spike is her chivalric Knight Errant and for her he changed his world. Eyes for You – Huge Yeah for another excellent round! Disclaimer: I do it for Spuffy! A/N: Base is a cap from a Promo Shot on one of the DVD’s downloaded from Civilized James before the site went toes up. It’s pretty. I arted it. Rating: R – sexual themes – explicit sexual descriptions in story. Images are worksafe. For my posting day for this round, I present two banners with wallpapers, Warm Chanpagne and Leather and Leather, under the cut. Totally worksafe. Here is a bunch of icons made from the two pieces. Feel free to snag any, be inspired to write stories or already have a story they’d suit. Happy to personalise if required. I’ve written a bit about my process after the images, for anyone interested. My goal here was to create a tribute to the comics using screen caps. So a combination of paint, photorealistic and drawing. Prompt: Celebrating 10 years of seasonal_spuffy and our love affair with the angst that is Spuffy. PS – I had not finished this piece when I posted because I was running late and still managed to come after the mod’s wrap up post. The finished (are they ever) banner is included in this post now. Disclaimer: Joss does not even own them, damn it! A/N: This is one of my fave Spuffy scenes and I liked the way the camera slowly panned them. From intent to murder to silent comforter. That Spike! He walks his own path and so does Buffy. A nice excuse to make a Photoshop action to clean up, textureise and present a bunch of images. Forgot to make an icon. And durn uploaded in order instead of reverse. One at a time add then it is. 28 images you scroll quickly to get one of those old time flickering films. :D Thans to Greenday who sometimes sound quite nice, for singing about our star crossed kids. Disclaimer: They belong to someone else. A/N: Some snaps of some my fave episodes and scenes in the journey that was Spike and Buffy from S4 to S7. One almost always begins with Something Blue for Spuffy. There was so much more to their engagement than a simple wish of “Why don’t they just get married.” The happiness, the intimacy, the thoughtfulness from both. Feelings to linger in both long after the spell. Disclaimer: Not my characters but they should be. A/N: An homage to the comics finally seeing the light and drawing the Spuffy!!! It’s about time!!! Comic Canon!! In colours of red and gold for the passion and truth of their love. A/N: I love this scene. Soft, a changing in their relationship, a new beginning after the horrors of S6. I’ve used the colours of passion and love – reds and purples – with a touch of gold for the truth and purity of his love for her and finally hers for him. The blues are for their strength and the texture for the depth of their passion, A tender moment that acknowledges what they recieve from the other. 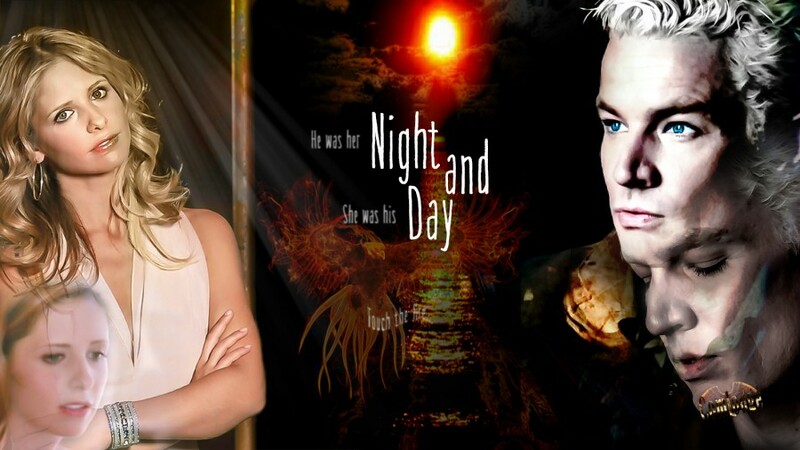 Summary: As I played around with a final project for seasonal spuffy, I took a break to catch up on the posts on that comm and read a future fic titled All the Shakespearoes written by anactoria. It’s a great post apocalyptic, post series and comics stories and I was prompted to produce the following. I do recommend the story though a warning, there is major charachter death. Disclaimer: I play for fun. Summary: So basically I’ve been able to work my Spuffy heart a lot this past week or three. The problem with Spuffy art, is that Joss was mean and gave us so little ‘couple’ time with these guys – even in promo shots. So one is restricted to either heads and caps from SB or S6 or Buffy bot and, nothing wrong with that, but we have to go rip off other peoples’ bodies to get in some good cuddling time. I’ve done a bit of both in my attempt to give my fave couple just a little romance. All totally work safe. As always, I’m happy for anyone to use anything that takes your fancy. So, I started with a simple one and used a time honoured phrase that i think fits them both well. Disclaimer: The charachters belong to others. This is a small tribute. Summary: A retrospective of a relationship that was unlikely, that began with obsession, continued in desperation and ended in love and sacrifice. Sorry, I don’t seem to be on good terms with the posting thingy here. A bunch of spuffy icons. Feel free to take. Sorry I feel like I spamming. Obviously been channeling Spuffy. A picspam of the last scene in Smashed.